Between 4,500 and 5,000 food carts are currently operating in New York City [2004 ]. Vendors must obtain a license from the Citywide Licensing Center, which is done through a lottery system. 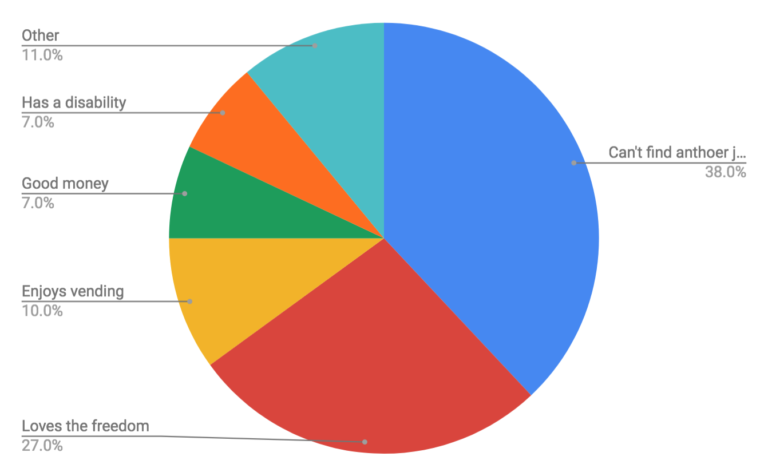 Different permits enable vendors to sell at any location in the five boroughs and to change location at any time, to sell in a single fixed location, or to sell anywhere in single borough. There are also seasonal permits available, which allow vendors to sell from April 1 through October 31. The cost of the permit ranges from $75 to $200, depending on whether the vendor will be cooking or selling precooked foods (this includes hotdogs and roasted nuts). All vendors are required to pass the Food Production course offered by the Health Academy. 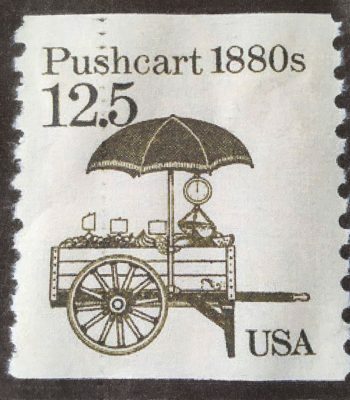 The first pushcart market was founded on Hester Street in 1866, when four peddlers parked their carts there. When they realized how quickly their wares were selling, they decided to stay at that location. New York City first started licensing peddlers in the late 1890s. By 1914, the number of licenses was frozen at 6,000. Most of the early pushcart vendors were Italians, who primarily sold fruits and vegetables. Around 1890, Yonah Schimmel, a Jewish immigrant and part-time Hebrew teacher, used a pushcart to start his knish bakery on the Lower East Side. In 1938, Mayor Fiorello La Guardia banned all 14,000 pushcart peddlers and ordered them to be confined to city-run enclosed markets. In 1983, a hot dog cost $.75. Mayor O’Dwyer (1946-1950) was an Irish immigrant and one-time pushcart peddler. Mayor Impellitteri (1950–1954) and Mayor Wagner (1954-1966) changed the face of markets by changing the face of the City, with housing development and Robert Moses’s planning. Mayor Koch’s father was a pushcart peddler, but during his term he greatly increased pushcart regulation, from capping the number of available licenses to limiting pushcarts to cross streets and restricting locations. Mayor Dinkins (1990-1993) was also a street vendor in his youth. Mayor Giuliani (1994-2001) started enforcing a multitude of laws, in the spirit of LaGuardia, that had long been ignored. His actions culminated in a proposal rid all peddlers from New York City street corners and relocate them in open-air-style markets. A ban of vendors from 42nd Street to Wall Street did take place, but was modified due to public outcry.